The two haven’t really gone head to head in this year’s Tour of Turkey, with crashes, obstructions in the finale and the tough terrain on some stages ensuring that they were never in contention in the final 100 metres of any stage. However yesterday’s victor Marcel Kittel appears to be looking forward to the chance of squaring up against his compatriot Andre Greipel on today’s final stage of the Tour of Turkey. Each have taken two stages apiece in the race, with Kittel triumphing on days one and seven and Greipel coming out best on stages four and five. While the Lotto Belisol rider was hampered by riders getting the sharp corner near the finish wrong yesterday, Kittel had a better run to the line. However he said that he nearly hit the deck himself. “To be honest the last two kilometres were very difficult, because almost every team was losing each other,” he said. “I also lost my guys, then I just came back onto the wheel of Nikias Arndt and the other guys with 1500 metres before the finish. The message clearly referred to the dominant victory of Mustafa Sayar, a rider with the Continental Torku Sekerspor team. 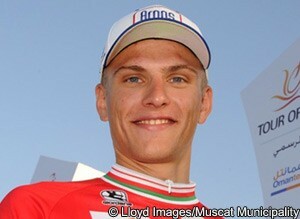 Kittel was asked about this in yesterday’s conference, but didn’t want to say much.